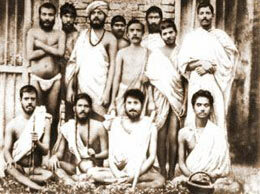 These young unmarried disciples of the Master, who belonged to his inner circle, had attended on him day and night at the Cossipore garden house, where Sri Ramakrishna had spent the last days of his life. After his passing away, most of them returned to their families against their will. They had not yet formally renounced the world. For a short while they kept their family names. But Sri Ramakrishna had made them renounce the world mentally. He himself had initiated several of them into the monastic life, giving them the ochre cloths of sannyāsis. But two or three of the Master’s attendants had no place to go. To them the large-hearted Surendra, who was a householder devotee of Ramakrishna said, “Brothers, where will you go? Let us rent a house. You will live there and make it our Master’s shrine; and we house-holders shall come there for consolation. How can we pass all our days and nights with our wives and children in the world? I used to spend a sum of money for the Master at Cossipore. I shall gladly give it now for your expenses.” Accordingly he rented a house for them at Baranagore, in the suburbs of Calcutta, and this place became gradually transformed into Math, or monastery. For the first few months Surendra contributed thirty rupees a month. As the other members joined the monastery one by one, he doubled his contribution, which he later increased to a hundred rupees. The monthly rent for the house was eleven rupees. The cook received six rupees a month. The rest was spent for food. Narendra who was busy conducting a law suit pertaining to his family, used to spend the night at the monastery. He exhorted the others to join the brotherhood. Lest this devotion should become dammed up within the narrow limits of a creed or cult, the leader forced them to study the thought of the world outside. He himself instructed them in western and eastern philosophy, comparative religion, theology, history, sociology, literature, art and science. He read out to them the great books of human thought, explained to them the evolution of the universal mind, discussed with them the problems of religion and philosophy, and led them indefatigably towards the wide horizons of the boundless truth which surpassed all limits of schools and races, and embraced and unified all particulars truths. This was how the Ramakrishna Math and Mission began from a small, dilapidated rented house from very humble origins.